There comes a time in every Athon when you think to yourself “if it wasn’t for Jan/Juneathon, I wouldn’t be doing this”. My moment has arrived on day two. I’ll admit that this is a teeny bit early, even by my standards. I may have only worked two days in the last fortnight (and they weren’t even consecutive) and yes, every day for the last two weeks has felt like a Saturday, but it’s Friiiiiiiday. I’ve had that Friday feeling all day and all I want to do is get home and commune with some wool. And possibly watch yesterday’s final of World’s Strongest Man…. But it’s Janathon and that means that I have to get off my bum and do something. My broad goals for this month are to get my short runs a bit faster and my long (relatively speaking) ones a bit longer. Tonight’s run involved belting out a mile and I was pleasantly surprised that I did it in 9.45. It’s not just the running that’s been getting a quick fix, my knitting also had a creative burst last night. Like most knitters, I am a bit of a yarnaholic. As far as I’m concerned, wool can be divided into “wool that is in my yarn stash” and “wool that is not yet in my yarn stash”. In my wisdom, I have decided that I should knit all some a bit of my stash before buying any new stuff. I’m starting with the odd balls that have been bought for me or I have bought on holiday (I love to buy something that I could only get from where we’re staying). Last night I settled down with a super chunky ball of Shachenmayer Tacoma (bless you) and belted out a dead easy cable headband (using the Winter Morning pattern from While They Play) that can become a dead easy cable neck-warmer when your ears become too toasty. Basically, I’ve made a woolly Buff. 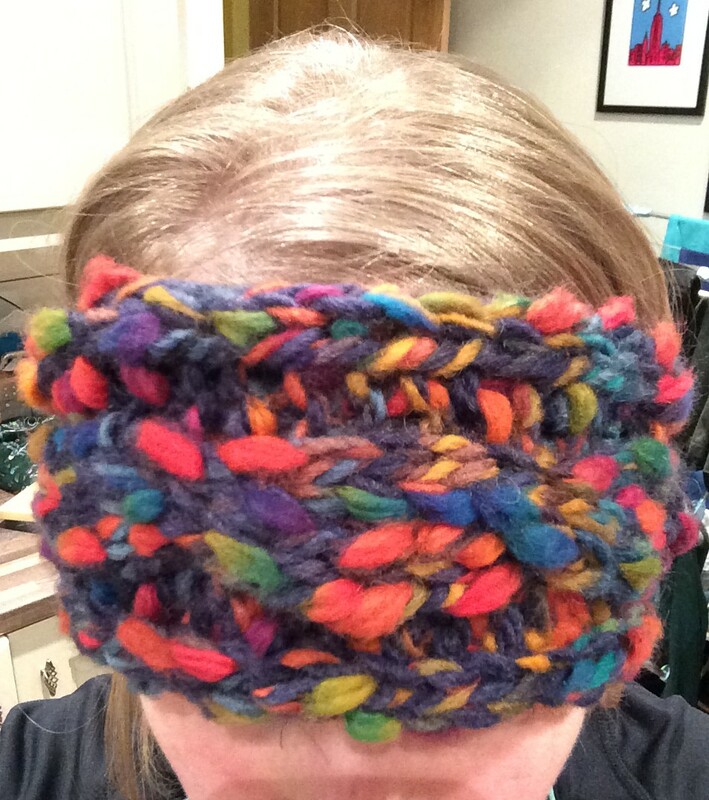 The wool doesn’t really do the pattern justice, but there was just enough in the ball to make a headband that is nice and snug which is all I really wanted! 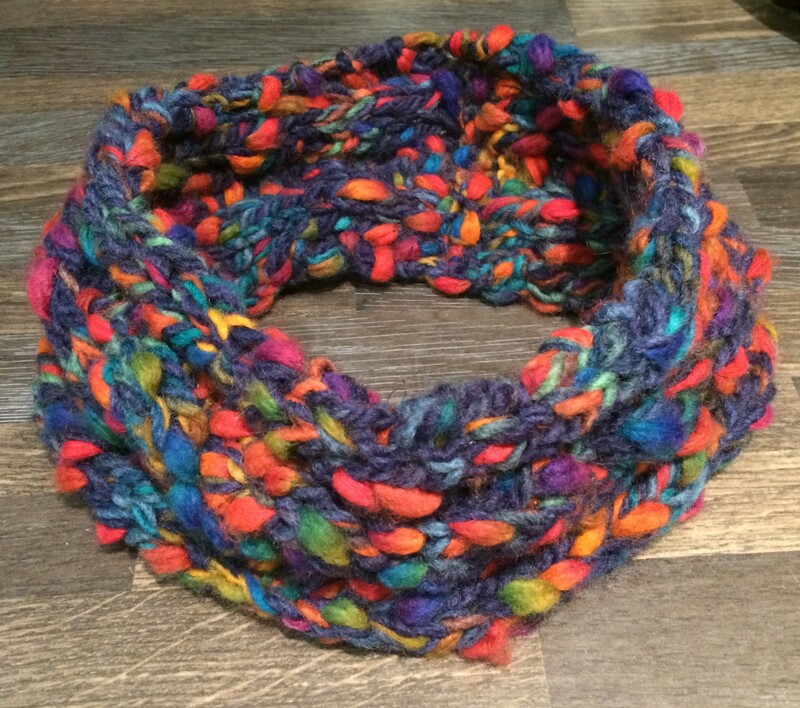 Janathon done AND a knitting finish – brilliant! I know how you feel about yarn! I love the chunky stuff with the big needles- quick results which means I can even get my son to knit!! Definitely something on my to-do list!